The following table lists all Set operators available in LINQ. Distinct Returns distinct values from a collection. Except Returns the difference between two sequences, which means the elements of one collection that do not appear in the second collection. Intersect Returns the intersection of two sequences, which means elements that appear in both the collections. Union Returns unique elements from two sequences, which means unique elements that appear in either of the two sequences. The Distinct extension method returns a new collection of unique elements from the given collection. The Distinct extension method doesn't compare values of complex type objects. You need to implement IEqualityComparer<T> interface in order to compare the values of complex types. In the following example, StudentComparer class implements IEqualityComparer<Student> to compare Student< objects. 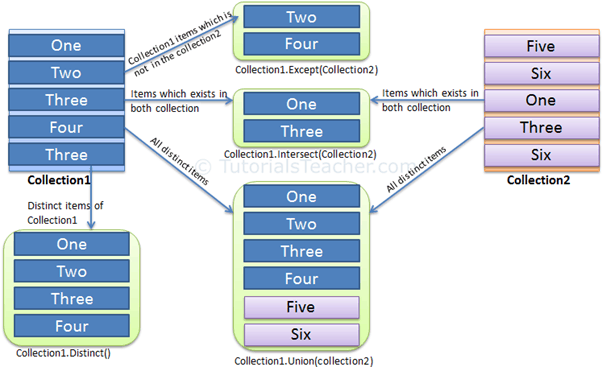 Now, you can pass an object of the above StudentComparer class in the Distinct() method as a parameter to compare the Student objects as shown below. The Distinct operator is Not Supported in C# Query syntax. However, you can use Distinct method of query variable or wrap whole query into brackets and then call Distinct().